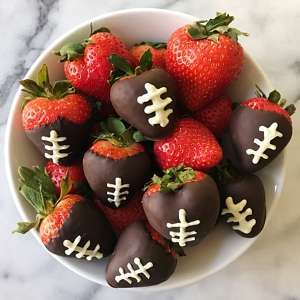 Every Super Bowl party needs some desserts and with these Chocolate Covered Strawberry Footballs everyone scores a touchdown! Inspired by posts on pinterest including My Mommy Style, they are simply strawberries dipped in melted dark chocolate chips (you could use milk chocolate or semi-sweet but we preferred dark chocolate) and with white chocolate piping. Don’t worry about the piping being difficult… Dessert decorating is not my thing at all, so this is on the easier side of things. We simply put the melted white chocolate in a freezer bag, cut a small hole and decorated the strawberries. The key was making sure the dark chocolate was completely cooled and set on the strawberries and making sure that the white chocolate was warm, not hot. They’re remarkably easy to make, festive and YUMMY! The perfect balance to all the salty and savory Super Bowl eats. And who doesn’t love strawberries + chocolate? A fun and healthy Gluten-Free treat perfect for football season and the Super Bowl! These dark chocolate dipped strawberries with white chocolate piping are remarkably easy to make and a win no matter who you're rooting for. Melt dark chocolate chips in a double boiler (my preference) or on stovetop or microwave. TIP: melt slowly on a low to medium heat so that the chocolate is smooth and doesn't burn or set. Set up a work station with melted strawberries, melted chocolate and a baking sheet lined with wax paper. Grab the strawberry by the leaves and dip strawberry into the chocolate and swirl it around carefully until it’s fully coated (I coated about ¾ of the berry so you could see some of the red berry but you could cover more if desired) Hold the berry above melted chocolate and gently "swing" it a few seconds to allow the excess chocolate to drip off. Place the strawberry on wax paper to dry. Then push it forward slightly to avoid a pool of dried chocolate forming in the front of your berry. While chocolate dipped strawberries cool, melt white chocolate in the double boiler (my preference) or stovetop or microwave. TIP: White chocolate tends to seize up or harden quicker than other chocolate so melt slowly on a low heat and stir frequently. When melted, remove from heat, let cool a few minutes and transfer to a freezer bag. At this point, I placed the freezer bag upright in a mug so that the white chocolate pooled in a corner and let it cool another 10 minutes or so. You want the white chocolate to be lukewarm, not hot and not so cool that it's hardening. To add piping, cut a small hole in the corner of the freezer bag and pipe a stripe down the center of the berry, doubling back once so that the line isn't too thin.Then pipe 3-5 lines across that center line to give the football effect. Best served that same day but can be made 24 hours in advance.